DONATE TO AMERICA MEDITATING RADIO TODAY. 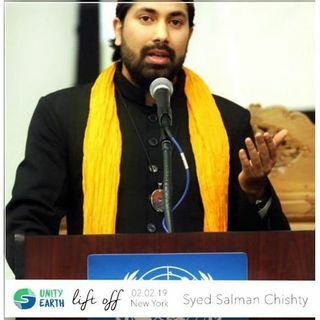 Haji Syed Salman Chishty is the 26th Generation Gaddi-Nashin through his Chishty family which has been engaged in serving at the globally famed, acknowledged and renowned center of Peace and Unity for the whole of Humanity. From an early age Haji Syed Salman Chishty has been passionate about the World Sufi Spiritual Traditions with a special focus on the Chishty Sufi Order. He has been dedicated towards his practical Sufi spiritual research studies on ... Más informaciones World Sufi Traditions and their impact on the different cultures and traditions of the world and vice versa. He has been constantly engaged in sharing the blessed Sufi teachings of great Sufi Grand Masters. Visit www.chishtyfoundation.org. Get the new Your Inner World – Guided Meditations by Sister Jenna. Like America Meditating. Visit our website at www.AmericaMeditating.org. Download our free Pause for Peace App for Apple or Android.